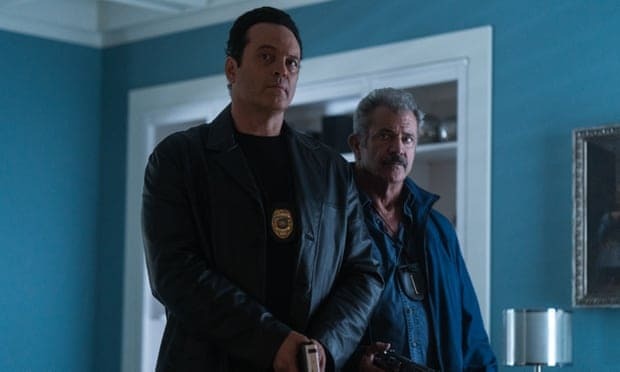 In Dragged Across Concrete, Mel Gibson and Vince Vaughn play cops Brett and Anthony, suspended for six weeks without pay for an act of police brutality. This perceived injustice stirs something in Mad Mel, and he becomes of the opinion that he and Vince should rob some gangsters as payback. This is the third film from S. Craig Zahler, after Bone Tomahawk with Kurt Russell and The Brawl in Cell Block 99, also starring Vaughn. Each follows a set template, in which a slow burn build-up moves inexorably towards an explosion of grindhouse violence. In his first two features both the first acts and the payoff is satisfying, helped by an attachment to the central leads and the obvious perils they face. In Dragged Across Concrete a slow moving script trickles to a halt. There was a moment in the cinema during which Vaughn and Gibson traded unfunny, uninteresting lines in a protracted stakeout that about a dozen people simultaneously got up, safe in the knowledge they could return in ten minutes and having missed out on nothing. When the action finally does arrive it does so hard. The enemies are almost superhumanly ruthless, evidenced most brutally in a heist which ensnares recent mother Kelly, played by Zahler regular Jennifer Carpenter. What can command begrudging respect is the director’s willingness to put his politics on his sleeve and put a finger up to anyone who whines about it. Not only is this done through the casting of Gibson in the first place, there is even an early scene in which the police chief bemoans the fact that ‘comments in a private phone call’ can wreck someone’s career, as Gibson sits in front of him. This is not a #BlackLivesMatter film for sure, with sympathies firmly with the police and their brutality presented as spurious. The rapport between Gibson and Vaughn is virtually zero, and it is hard to believe these two have been partners for years. Vince Vaughn has showed he can do drama in Cell Block 99 and True Detective, and the problems here aren’t so much in performance per se so much as a mismatch in casting and Zahler’s inability to write memorable dialogue. Tory Kittles puts in a better performance as the gangster who just wants to provide for his family (another directorial trope). It is also somewhat refreshing, as without him it would be three in a row for Zahler in ‘white man against profoundly evil ethnic minority’ plotlines. Dragged Across Concrete impresses in its action scenes, even if they are too thinly dispersed to keep an audience engaged, especially in the opening hour. The music is also great throughout, a personal favourite being ‘Shotgun Safari’. All in all while problematic it is just about a thumbs up from me, though if Dragged Across Concrete’s two and a half hour runtime had been condensed to two this would be a film on a comparable level to the director’s previous work. Christopher Marchant is an entertainment journalist with a degree in Film from Sussex University, and an MA in Newspaper Journalism from City University London. In his spare time he likes obsessing over American politics and long walks along Ruislip Lido. A collection of Christopher's works can be found at christophermarchant.wordpress.com, and he tweets at @BrianInvincible.